Just for the spamming with irrelevant content I think I'm giving a subscribe to the competing party. My bad, off topic. Still a cheap trick for subscribers though. Why anyone would give a flying rat’s **** about any of this is beyond me. I think I’ve officially become too old to understand these things. To all those opposed... you should see what the others are doing. If you haven’t been following the war, you’re missing out on one of the greatest internet conflicts of all time. The amount of devotion and unity required to pull this off and keep pewds at number 1 for so long (he’s been threatened since around September) is truly remarkable. And the best part is, it’s all pretty much just a meme. Also, for those who dislike PewDiePie, I used to be in your boat. I used to think he was just this annoying big name that got thrown around and wouldn’t go away, then I started watching his videos, and I found out why he’s been number 1 since 2013. Just give him a shot, and if you don’t like him, that’s ok. But don’t judge him, or anyone else before you consider them. Maybe if he spent less time promoting white supremacists and playing **** he wouldn't have to have random people begging for subscribers for him? You believe Vox media? The “white supremacist” he promoted was a channel that he liked for making anime reviews, particularly the one on death note. The channel in question made a few edgy jokes, and was promoted alongside many other channels at the end of one of his videos. Felix himself stated in a later video that he wasn’t aware of that aspect of the channels content, and removed its promotion from the original video. Either way, this isn’t the place for political discussions. 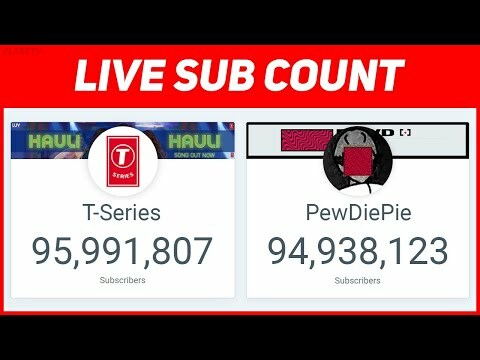 As for why PewDiePie is losing, it’s more that T-series is winning. They are the biggest record label company in India, meaning that if someone likes music on India, they have a very high chance of liking T series also. T series posts several videos each day of movie trailers, music videos, artist promotions, etc. so the cover a wide variety of interests. As it happens, more people are receiving internet connection in India, so once they get on YouTube and see that there’s a channel with all their favorite music on it, you bet they’ll be subscribing. The problem with this is, YouTube is a platform for the creator, and PewDiePie is the biggest and best of the individual creators. T series is a faceless corporation, and if they win, then that means YouTube has been essentially turned into another channel on your TV. In conclusion, t series is increasing at a fairly constant rate, (at the rate that India receives WiFi) and PewDiePie and his supporters have been winning against that rate because of their continued aid. The only people really against Felix in this conflict are those who are ignorant of who he really is and what content he makes, or those who are being deliberately antagonistic in the conflict. There’s a lot more going on here than simple numbers. But at the same time, the whole thing is just a meme. That’s what’s great about the internet. Its a sw subforum, of course they are too old to understand pewds. Heck, as an indian, i don't care, he should be 1st. A company SHOULD NOT top a lone man working hard since almost a decade, just cause a bunch of people suddenly gained access to internet and have an inherent bad taste. I don't even watch his videos, but am subscribed to him because i know and understand things. Just subscribed to T-Series. Hadn’t heard of it. Thanks OP! Closing this now, we're not here to discuss things like politics and the moment we got into a discussion of white supremacists, we went too far.